Pardot’s Salesforce connector can be used to pass data back and forth between Pardot and Salesforce. 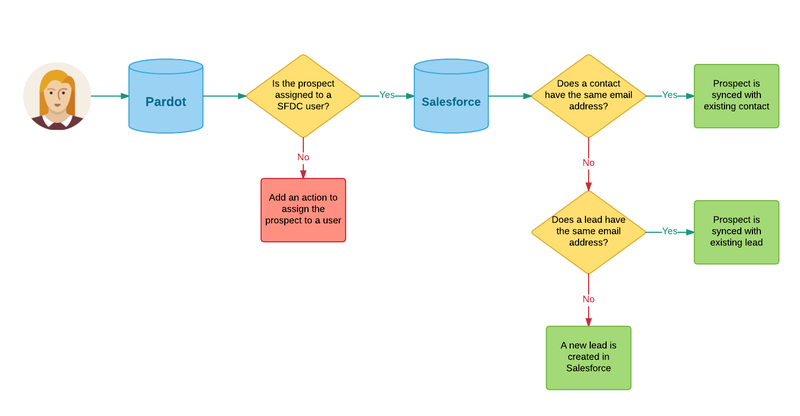 In this article, learn everything about the Salesforce connector including what objects are synced, what happens if the prospect already exists in Pardot and how Pardot and how to map Salesforce users to Pardot users. A prospect is synced to Salesforce when the record has been assigned to a user. A user can be assigned using a completion action or by using an automation rule. Since Pardot uses email address as it’s unqiue identifier, Pardot will check to see if there’s a contact in Salesforce with the same email address and then check if there’s a lead with the same email address. If there’s no email address that matches the prospect in Salesforce, Pardot will create a new lead in Salesforce. This can be illustrated with this flow chart. By clicking the send to Pardot button on the lead or the contact record in Salesforce. By manually uploading the lead or contact’s email address into Pardot. Once the Pardot prospect and the Salesforce lead/contact are connected, Pardot will check for changes in Salesforce every 2 minutes. Salesforce campaigns do not have a one-to-one relationship with Pardot campaigns. Therefore, once a prospect has been added to a Pardot campaign, they are not automatically added to a Salesforce campaign. When you set up a rule using one of these methods you will be able to see the action criteria to add to Salesforce campaign. 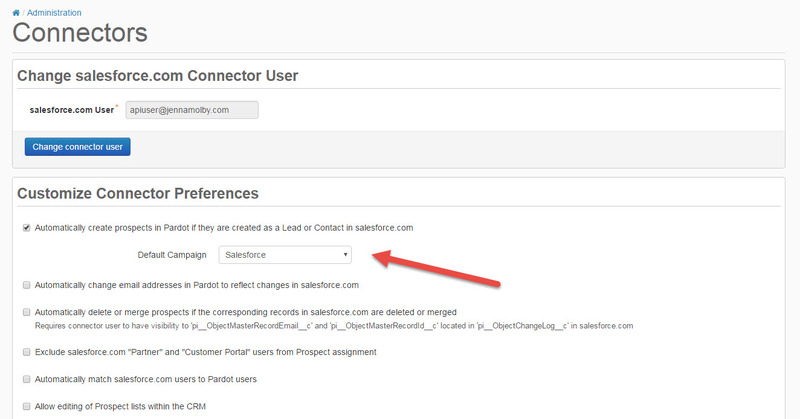 When you verify your Salesforce connector with Pardot, the default fields for leads/contacts and accounts are set up automatically. 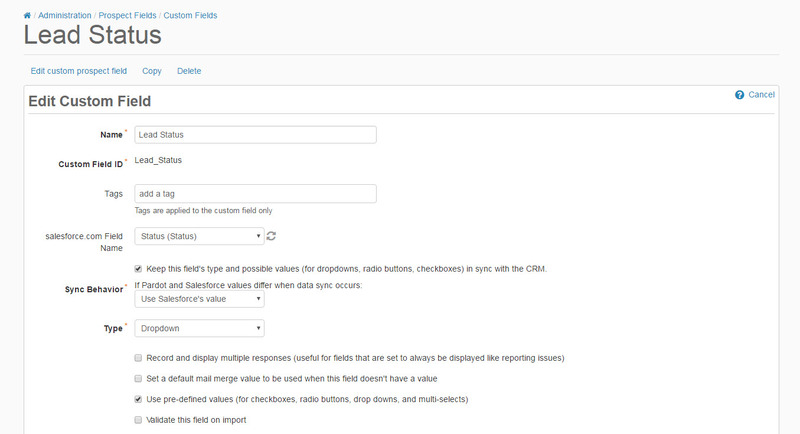 Any custom fields will need to be created in Pardot and mapped to the corresponding Salesforce field. I changed a contact’s email address in Salesforce, but the change isn’t syncing to Pardot. 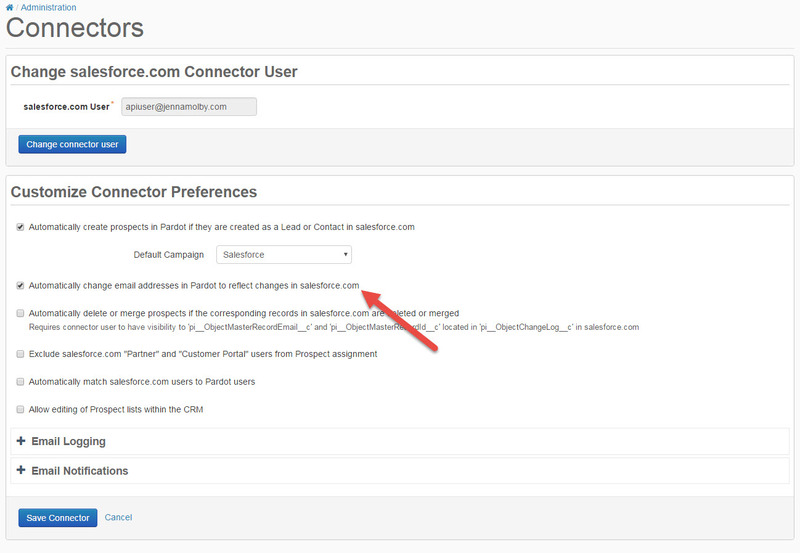 This is the expected behaviour of the Salesforce connector unless you have the setting Automaticallly change email addresses in Pardot to reflect changes in Salesforce.com enabled under the Salesforce connector settings. My Prospects aren’t syncing to Salesforce. Fix any errors and try syncing the record with Salesforce again. If you have no errors, make sure the record is assigned to a user. You can check this by clicking into the prospect in Pardot and looking for an assigned user under the Insight table. Do you have Questions about Pardot’s Salesforce Sync? Hi There- Thanks for the article! The issue I'm having is that new prospects in pardot are not creating leads in salesforce. Is there a way to create a lead no matter what every time? Right now our sales team isnt getting notified of new leads if there is a contact in salesforce and its a major problem because leads are slipping through the cracks. Thanks! Yes, I agree with you. thanks for sharing this topic. This is so informative and effective. I am searching this type of post and luckily found your one.